Last week, the world observed Earth Hour. Across Canada people flipped off the lights in a symbolic gesture to support action against climate change. But some influential voices like Watt-Cloutier and Mary Robinson -- former prime minister of Ireland and United Nations High Commissioner -- suggest we're looking at climate change the wrong way. Climate change is not only an environmental issue, they say. It's also a human rights issue. 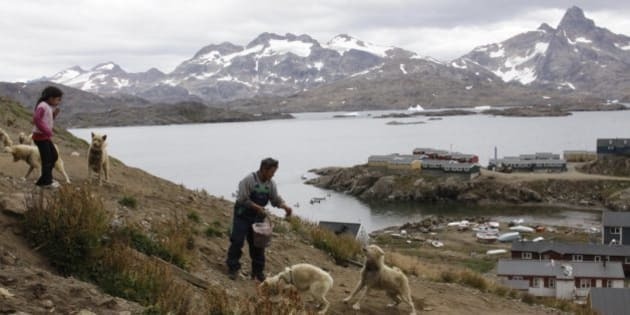 Gert Ignatiussen throws a chunk of seal meat to one of his sled dogs in Tasiilaq, an Inuit town on the southeast coast of Greenland, in this photograph taken on Aug. 25, 2009. Ignatiussen was the winner of Greenland's annual amateur mineral hunt, a competition that the local government hopes will spur Greenlanders to take interest in the hidden resources being uncovered by the Arctic thaw. ( AP Photo/Karl Ritter). Inuit activist Sheila Watt-Cloutier remembers the day her neighbour didn't come home. Simon Nattaq lives across the street from Watt-Cloutier in Iqaluit, Nunavut. He's a hunter with decades of experience and traditional knowledge handed down through generations. He knows the land -- when it's safe to go out on the ice. But in February 2001, an unexpected weak spot on a normally safe trail caught him by surprise and his snowmobile plunged through the ice. Nattaq clambered out of the water and survived until rescuers found him two days later. By then, frostbite had done its work. Both of Nattaq's legs had to be amputated. For Watt-Cloutier -- a former politician and chair of the Inuit Circumpolar Council -- the story illustrates how climate change attacks not just the environment, but the very foundations of Inuit knowledge, tradition and identity. Last week, the world observed Earth Hour. Across Canada people flipped off the lights in a symbolic gesture to support action against climate change. But some influential voices like Watt-Cloutier and Mary Robinson -- former prime minister of Ireland and United Nations High Commissioner -- suggest we're looking at climate change the wrong way. Climate change is not only an environmental issue, they say. It's also a human rights issue. "Our right to educate, right to culture, right to health, our right to be Inuit as we know it, is at stake," argues Watt-Cloutier. Her recently published memoir The Right To Be Cold (Allen Lane Canada, 2015) touches extensively on the connection between climate change and the rights of Inuit people. Watt-Cloutier views climate change as the second wave of an assault on Inuit identity. The first wave being residential schools. It's not simply that warming waters and melting ice in the North make an unforgiving landscape more unpredictable and treacherous. They affect hunting, which impacts an already difficult food security problem. Watt-Cloutier adds the changing environment impedes the Inuit from teaching and passing on their culture and traditions to the next generation, because these elements of their identity are inexorably linked to the land. This loss of identity, in turn, fuels social problems like terrifyingly high suicide rates. "If we think we have problems now, we ain't seen nothing yet," Watt-Cloutier ominously predicts. Mary Robinson has travelled extensively and seen the greatest atrocities facing our world. Robinson was U.N. High Commissioner for Human Rights from 1997 to 2002, and is a member of The Elders -- a group of global leaders founded by Nelson Mandela to fight for peace and human rights. Of all she has witnessed, it's climate change that robs her of sleep. "As many as 200-million people may be displaced by climate change by 2050. That keeps me awake and gets me going in the morning." Robinson, who has her own foundation, Climate Justice, tells us that throughout developing communities around the world she "kept on hearing the same refrain from people." As with the Inuit, age-old wisdom has been thrown out the window by climate change. Planting seasons, weather patterns, drought and rain cycles -- nothing is predictable anymore. People don't know when to plant or when to harvest. Meanwhile, the U.N. has just released a report estimating that by 2030 -- just 15 years from now -- there will only be enough fresh water to meet 60 per cent of the world's need. Robinson points out this impact on basic human rights -- the right to food and water -- has a cascade effect on other rights, like gender equality. "Who is most affected among the poor? It is women. About 70 per cent of farmers in Africa are women. They have to put food on the table even if there is drought. They have to go further when water sources dry up." With all the evidence, why has the world taken only the most tentative steps to address climate change? Perhaps because we've always framed the question too narrowly. Save the planet. Save the polar bears. When really what we need to recognize is we're saving ourselves -- from hunger, from inequality, from losing a wealth of cultural traditions and knowledge. Fighting climate change is fighting for human rights.